Everything about ImageEditOnline.com and why it has been built. As a website developer and app builder for both Android and iOS devices, I have constantly used online image editing tools for project graphics. Working on a low budget and trying to produce quality websites and apps, the online editing tools have been incredibly cost effective. Wether it is rounding an image to create an icon, a logo or a more advances image using frames, layers and filters, there are lots of free online image editing tools available. The idea of ImageEditOnline.com is more of a personal thing than a business venture. Having all the necessary editing tools on one website that I can load and use freely, the ability to add more features with every project or idea and hopefully being able to monetise the website so I can invest into more features to help future projects, just seems to make perfect sense! The idea came around through a listing on Flippa, a starter site that sold for around $100. The website was perfect, better than most I normally use for my own projects. I did some research and found the author of the script and bought a copy. As a website developer, I am working around the coding and learning how to change the editing tools, add more features and make it more user friendly. The better it gets the better it is for my own projects and hopefully many others will find Image Edit Online useful. The basic tools found on many online image editors. Most of the basic tools are already built into Windows or Mac. Resize, crop and save as JPG or PNG. Most of the time, that is all I need to turn a screenshot into an app graphic or resize a website logo. For such things as rounding an image for an app icon or some more advanced features, there are many websites that do just that, however, it would take work on the laptop, a visit to the website, download the image and re-edit it on the laptop. All the basic features are built in, crop, rotate, round, colour and resize, saving a lot of time on basic requirements. Creating a logo is much easier. There are lots of logo maker websites and I have probably used the all. One thing that I find is you either need to pay to download a transparent background PNG or the available icons and graphics are very limited or you need to visit 2 or 3 sites to create a single logo. All the features to create amazing logos have been included. Using the text editor, frames, stickers and the transparent gradient filter with the option to upload and layer images before merging, you can create a logo for any niche. From apps to website version. Many app projects have been sticker or photo manipulation apps. Fun frames, Mag Your Pic, Face in Hole, Stickers and Meme Generators. All great but it is hard to keep up with new device models, software updates and compatibility. Image Edit Online can be used on any device, no app to download, no special requirements, it runs in any browser, mobile friendly. Most people will download a specific app to do a specific task, “Put your face on a magazine”, “Add emojis to your photo” or maybe adding text to an image to create a meme. Adding all the app features into a website is a bit of fun, but some of the features are quite useful for graphic design and desktop publishing. The option to access everything on any device without installing an app, for me, is a life saver when it comes to working away from home. Why is Image Edit Online free for everyone to use? The answer is simple! I need a website with all the resources required for the graphical side of my work rolled into one. All the frames, stickers and effects are not cheap, they come with a price tag. The more resources available creates a much better end result, improving the quality of my work and and increase in demand. How do the other sites work? How do they afford to add new features? Most of the sites are monetised, earning some advertising revenue or charging for various premium features. For this website, having the features to improve my own work quality, saving time and the possibility of some advertising revenue, it is a really good scenario and one that can be used to help others for free. If you do enjoy using the tools, maybe you would share the site with your colleagues, friends and family. Image Edit Online is free and can be used privately or commercially without license. If you are wondering if it is ok to use Image Edit Online for your commercial projects, yes it is. 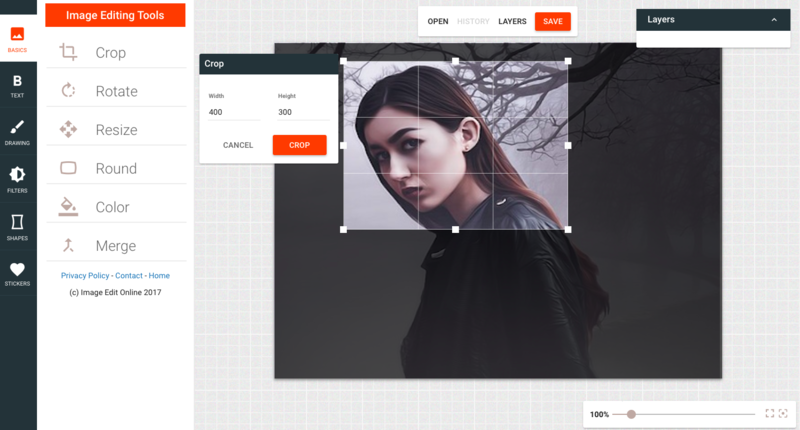 There is no signup and all image and photo editing tools are available for free. You will not find any annoying watermark on your creations and you can download as a transparent PNG or JPG. There are absolutely no limitations or requirements when using Image Edit Online. It would be an absolute pleasure to see a logo or some graphical work on a highly successful venture with credit to ImageEditOnline.com! We have lots of video guides to help you with image editing! Take a look around the website, you will find lots of video demos and guides to help you get started with the image editor. Experiment as much as you like until you become familiar with all the functions and features. More stickers, frames, fonts and features will be added regularly. Maybe you would like to share some of your work or video demos with the site visitors. If you can, that would be fantastic!